From Drawn State: "I was at a Movers’n’Shakers breakfast this morning and happened to bump into someone from Llewellyn Davies Yeang. 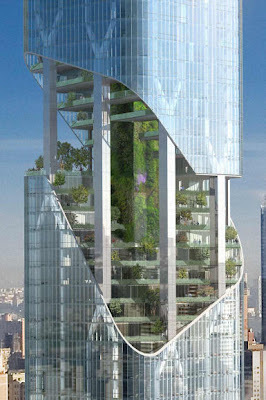 I had just seen this image of Daniel Libeskind’s latest tower in New York, and said I thought it bore a remarkable resemblance to Ken Yeang’s various “vegitecture” buildings. Vegitecture is essentially the use of organic materials as an element of construction. It has mainly manifested itself over here as sedum walls, but the idea goes further – looking at how rainwater can be harvested and air purified using natural means. 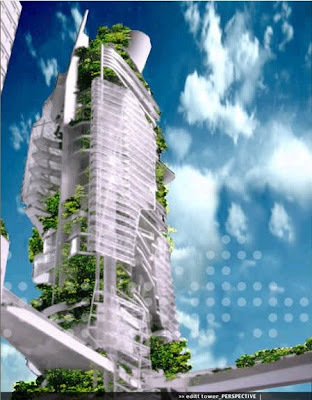 Yeang, who has been lecturing on the concept for years, has even suggested the concept of a “vertical farm” where tenants grow their own fruit and vegetables on the walls and roofs. Back to the Libeskind similarity. It turns out some at LDY have thought exactly the same thing as me, with e-mails flying back and forth remarking on the resemblance. However my source assured me the practice was flattered at the resemblance, rather than concerned about plagiarism. Vegitecture has now become an architectural sub-genre - US superarchitect Perkins + Will have also jumped on the veggie bandwagon. Who is to say, now that Libeskind has joined suit, that some of his fellow starchitects might not do the same thing?" I do like the reference to architectural sub-genre of veg.itecture... and as far as a chronology of true Vegitecture, obviously Yeang is an early pioneer - not just as an aesthetic endeavor but in truly combining landscape and architecture for improving and substituting building systems. It's heartening to see the crowd following and learning and mimicking these (and improving on them) - and these pages at L+U suggest that the sub-genre is alive and well. Lo and behold, another reference on Web Urbanist with a snippet of Vegitecture Sustainable Community Design - featuring mostly the the work of Ken Yeang. Via WebUrbanist: "What if architects thought of ‘green’ as a building material, an integral material to be thought of throughout the design process or even as the basis for it? 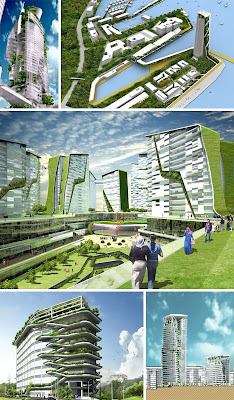 This visionary community design wraps green into every layer, aspect and dimension of the design to the point where sustainability runs through the final project like an endless mobius strip, completely interwoven with the rest of the architecture on the site."